Complex Says: If this Vespa was merely painted to look like a cow, it would have no justifiable place on this list. However, the seller specifies that the cow pattern is actually a fabric wrap. 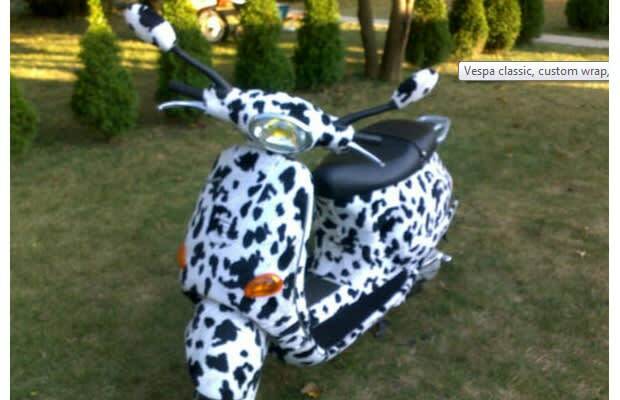 We have to wonder about the maintenance involved with keeping this cow-patterned Vespa looking its best. Obviously, a normal wash won&apos;t do the trick if you win the auction. We hope the fabric is dye-fast, or your first rainstorm out on your new Vespa will see you standing in a sad puddle of melted cow spots.